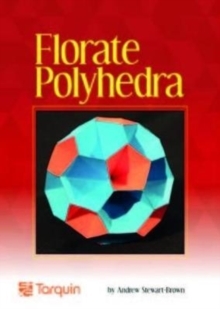 These models of regular and semi-regular polyhedra bear some resemblance to flower heads, so florate seems a good adjective to describe them. They also demonstrate many basic geometric principles. If the vertices of the polyhedra are joined to their centres by straight lines, a set of pyramids appears, based on the regular polygons: equilateral triangles, squares, pentagons, octagons, decagons and dodecagons. If the radii of the polyhedral are extended outwards to infinity, we can visualise Euclidean space divided into four regions by the tetrahedron, six by the cube, eight by the octahedron and so on. The ratios of the sides of the isosceles triangles which form the sloping slides are remarkably simple. Once the method of using a straight-edge and compasses to make surd or irrational lengths has been understood, the nets of triangles are easily constructed. The nets for all thirteen models in this book may be constructed using the ratios given in the table. Designers, architects, model-makers and students who enjoy working with compasses will enjoy constructing the nets and making the models. Teachers who show their students how to make these models will see them enjoying the whole process of starting from the principles of geometry and ending with an attractive physical artefact.